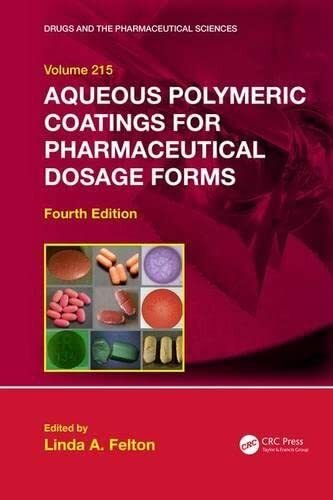 [PDF] Aqueous Polymeric Coatings for Pharmaceutical Dosage Forms, Fourth Edition (Drugs and the Pharmaceutical Sciences) | Free eBooks Download - EBOOKEE! Description: Aqueous-based film coating has become routine in the pharmaceutical industry. This process eliminates the use of organic solvents and thus avoids economic, environmental, and toxicological issues related to residual solvents and solvent recovery. Aqueous-based coating, however, is complex and many variables may impact the final product and its performance. This fourth edition of Aqueous Polymeric Coatings for Pharmaceutical Dosage Forms aims to provide insight into the factors and parameters that should be considered and controlled for the successful development and commercialization of a coated product. The fourth edition has been revised and expanded to reflect the most recent scientific advancements from the literature. The contributing authors explain in detail, using illustrated examples, appropriate steps to solve and ideally avoid formulation, processing, and stability problems and to achieve an optimized dosage form. Trade names and chemical names of commercially marketed coatings are used throughout the text to help familiarize the reader with the various materials available for pharmaceutical applications. This book will be a valuable resource for anyone in the pharmaceutical industry working in the area of aqueous-based film coating. No comments for "[PDF] Aqueous Polymeric Coatings for Pharmaceutical Dosage Forms, Fourth Edition (Drugs and the Pharmaceutical Sciences)".